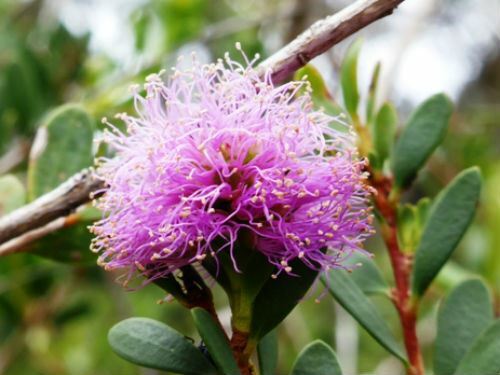 Melaleuca nesophila is known as the Showy Honey-myrtle and will usually develop into a tall shrub or small tree. In our cold climate garden plants have reached a height of three metres in more than ten years. 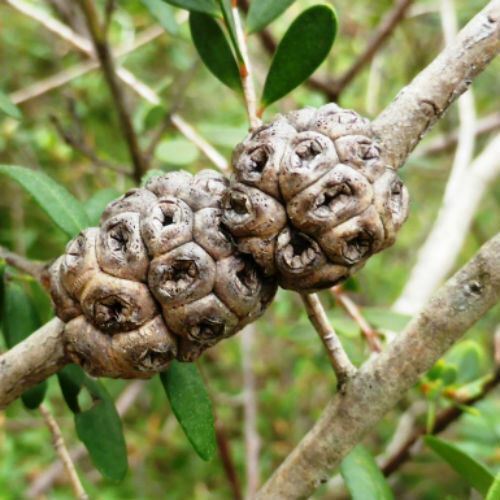 Plants are upright, stiff with grayish, papery bark. Leaves are elliptical, up to two centimetres long and bright green. Flowers are held in globular, terminal heads up to three centimetres across. Blooms are mauve-purple with yellow anthers and are both conspicuous and profuse. Flowering extends from late spring to midsummer. Flowers are followed by fused, globular capsules (see thumbnail). Prune lightly after flowering to avoid plants becoming straggly. Melaleuca nesophila is found on the south coast of Western Australia. The species name means island-loving. The species was first found on an island off the Western Australian coast. Melaleuca nesophila is cultivated as a street tree. Some years ago we came across specimens growing along the streets of Echuca, northern Victoria.